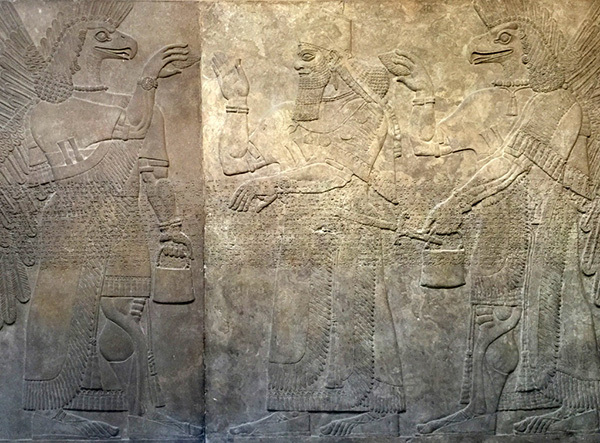 For years I have marvelled at the evocative reliefs of Assyrian kings and their peculiar-looking protective gods, and contemplated what is in the bag they so proudly clutch in their hands. 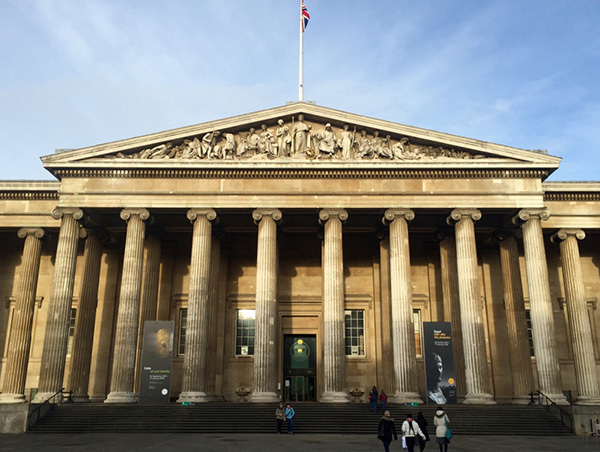 On a recent visit to the British Museum a friend and I tested a hypothesis that the answer to the mystery involved bees. I have visited the British Museum on a regular basis for almost two decades and on each occasion I always find something new to explore. 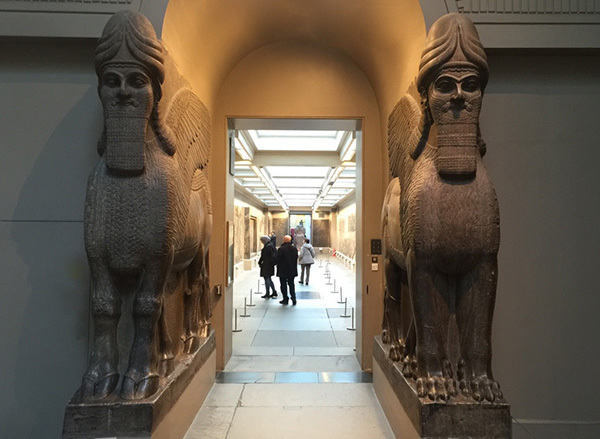 On this visit we strolled through the museum’s remarkable Egyptian exhibits before arriving at the less popular, but equally fascinating, Assyrian Halls, which contain many priceless relics from the major Mesopotamian East Semitic kingdom of the Ancient Near East that existed from circa 2500 BCE until 600 BCE. 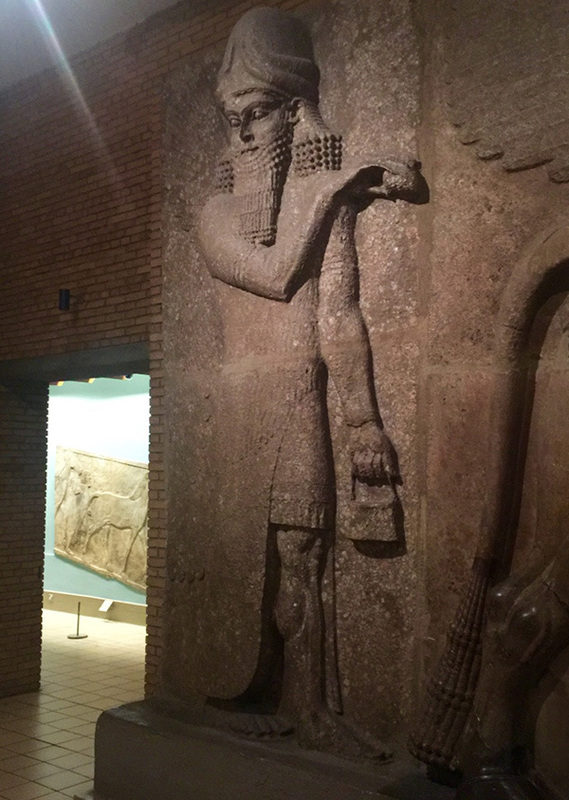 Here we studied the remarkable life-size reliefs, including those of the Neo-Assyrian King Ashurnasirpal II (883-859 BCE), who built his magnificent palace at Nimrud, in Northern Iraq. 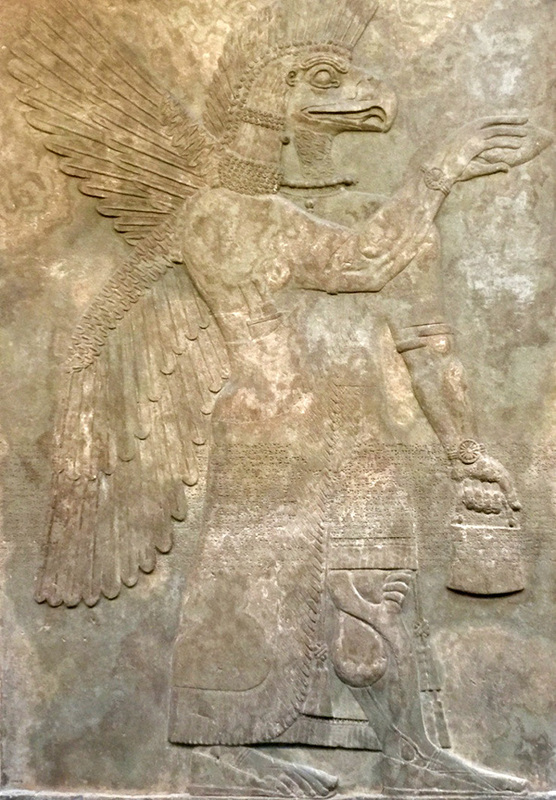 We also examined the many winged and often eagle-headed images known as Apkallu, demigod sages created by the god Enki, which the British Museum referred to as ‘protective spirits’. For some reason, on this day the reliefs of the eagle-headed gods, the Apkallu, intrigued me more than ever. I fought to clear the cobwebs in my mind. Before long I recalled that Gilgamesh, the legendary Sumerian king, was once protected by an eagle. 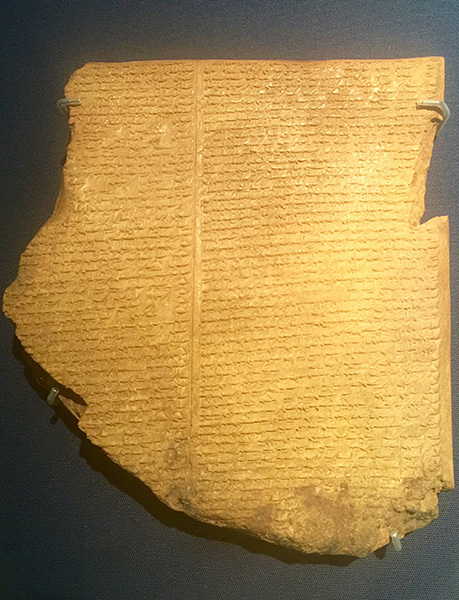 Gilgamesh ruled at Uruk, an ancient city of Sumer, and later Babylonia, circa 2700 BCE; and rule he did, for a whopping 126 years, according to the Sumerian King List. Gilgamesh is also said to have been the first king to have an entirely human Apkallu – a creature known as an ummanu. In a work by the Roman author Aelian (175-235 CE), who recounts an earlier tale, the King of Babylon was informed by an oracle that his grandson Gilgamos (Greek for Gilgamesh) would assassinate him, and thus promptly threw him out of a high tower to his certain death, only to have an eagle break the future king’s fall. Famously, the Epic of Gilgamesh also includes a flood story very similar to the tale of the deluge recounted in the book of Genesis, underscoring the fact that Sumerian history forms the background for much of the early portions of Genesis. 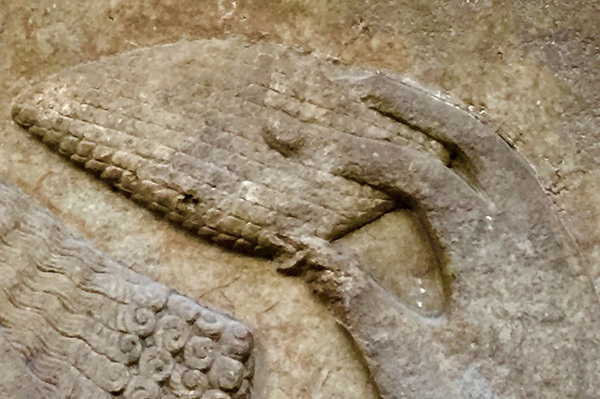 In the Assyrian tradition the Apkallu appear not only as eagle-headed gods, but also as fish-skin-cloaked and human-headed gods. Each was considered a protector – a guardian against evil spirits. Curiously, many believe that the Apkallu were one and the same as the nephilim of Genesis fame: gods or angels, as some believe, who fell from grace and conducted themselves inappropriately with the lesser-endowed human race. Some even believe that they may have become the prototype for the biblical figure Enoch, ancestor of Noah. We were transfixed. As tourists came and went we discussed how the Apkallu reliefs seemed to portray a blessing; one hand held a bag, while the other presented what appeared to be a pine cone to the tree of life and, in other instances, to the king. Disappointingly, the museum’s description of the reliefs offered no insight into their real meaning, choosing instead to focus on who they represented, and where they were from. If one did not know better, it would appear that the symbolism of the reliefs was lost on academia. 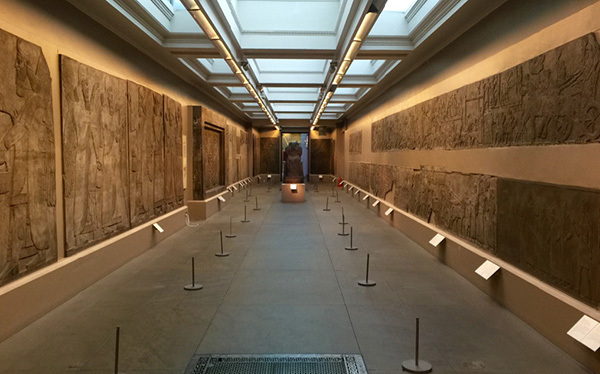 As we debated the symbolism of the reliefs, a museum guide entered the hall with an assembly of approximately twenty visitors. The group was heading to an adjoining room and I could not help but notice that the guide was lecturing with great assurance, if not bravado, as they hurried past. I was aware that British Museum guides were required to be subject-area experts and so I seized my opportunity and unabashedly leapt between the guide and his group. Without thinking, I blurted, ‘Excuse me, I don’t mean to interrupt, but this is important.’ I gasped before continuing, as I had succeeded in gaining his attention. ‘What do they keep in the bag?’ I asked, pointing to the eagle-headed relief in front of me. I waited for his reply, expecting sarcasm, followed by visual condemnation, if not verbal abuse, from the group. Luckily, he seemed pleased with my question and looked me over, as though I would appreciate his answer. ‘Pollen,’ he replied, with his unique brand of understated swagger. I reacted with a fist pump, as though I had just discovered that I had matched six numbers on the weekly lottery. ‘Thank you,’ I said with gratitude. Not only had the guide offered an explanation to the mystery, but he had confirmed our hypothesis: the symbolism involved bees. ‘But what about the other hand – the one gripping the pine cone?’ I feared I was now tempting fate, but fortunately the guide was unfazed by my persistence. The tour group, on the other hand, was clearly becoming restless. ‘It’s not a pinecone,’ he said tauntingly, pausing for dramatic effect, ‘it’s a date palm.’ I nodded, while patiently awaiting his full explanation. ‘The King, or Spirit Guide, is dipping the sacred date palm into the bag of pollen and symbolically pollinating his kingdom,’ he said. Bingo. My friend and I looked at each other with the sort of glee that only bee nerds could appreciate. The entire exchange had taken no more than thirty seconds. I thanked the guide and watched as he resumed the tour as though he had never been accosted. A few minutes later we searched for him, as our follow-on questions mounted, but there was no trace of him. We inquired at the information desk, but the attendants were not aware of a tour being held at that time. He had vanished without a trace. Later that night I confirmed the validity of what the guide had said and, sure enough, the ancient Mesopotamian description of the objects was consistent with our conclusions; the Akkadian word banddudû translated as bucket, and mullilu as purifier. Inexplicably, despite this fact, scholarly research on the matter was divided on what was being conveyed in the symbolism. We, on the other hand, were now more certain than ever as to its meaning. Needless to say, I was thrilled with the encounter, for it not only confirmed our suspicion that the bag was part of a symbolic blessing scene involving pollen, it also suggested that the Assyrian Kings, and the Apkallu, were emulating bees, which in effect made them bee-gods. As audacious as this conclusion may appear, there are a number of intriguing references to bees in Mesopotamian mythology, including one in the Bible which, not surprisingly, is a story that has been lifted from the pages of Mesopotamian history. 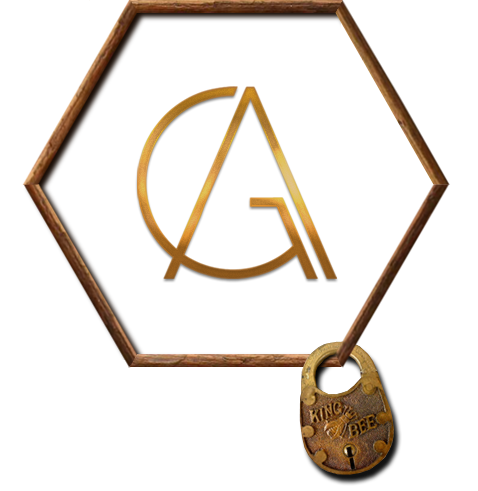 Before reviewing these legends – starting with the Biblical reference – it is worth recalling that, with respect to the Bible and bees, Jesus Christ was known as an Aetherial bee. Bees appeared on statues of the Goddess Artemis (whose priests were called Essenes, or King Bees) and Ephesus, the city where her most famous, bee-laden statues hail from, had a bronze-age name that translated as ‘bee’. Further, honey is mentioned sixty-one times in the King James Bible, and the Book of Luke (24:41-43) confirms that the first food eaten by Jesus Christ after his resurrection was a honeycomb. As we shall soon see, Ethiopian, Egyptian and Assyrian kings were each associated with bees. But what about the fly? Its symbolism remains unclear. What we can say with certainty is that the two texts appear to be the Lord beckoning each country (Egypt and Assyria) to his aid. But could it be that straightforward? At the time of Isaiah the Egyptian Twenty-Fifth Dynasty was known as the Nubian Dynasty, or the Kushite Empire; Ethiopian kings who ruled as Pharaohs until the Assyrian conquest ended their reign. 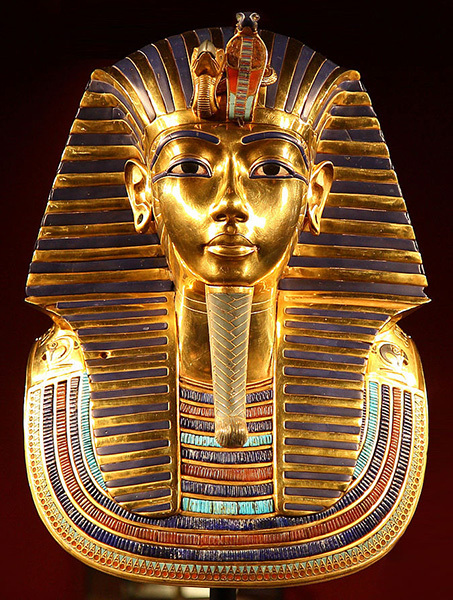 The Twenty-Sixth Egyptian Dynasty ensued and became the last native dynasty to rule before the Persian conquest. Intriguingly, there is a tradition that bees selected Ethiopian kings, and perhaps the best-known source for this legend is the famous ruler of the Ethiopian Zagwe dynasty, King Lalibela, who reigned from 1167 to 1207. According to legend, a swarm of bees surrounded the Prince at his birth, which his mother interpreted as soldiers who would later serve her son, prompting her to choose for him the name Lalibela, meaning ‘the bees recognise his sovereignty’. 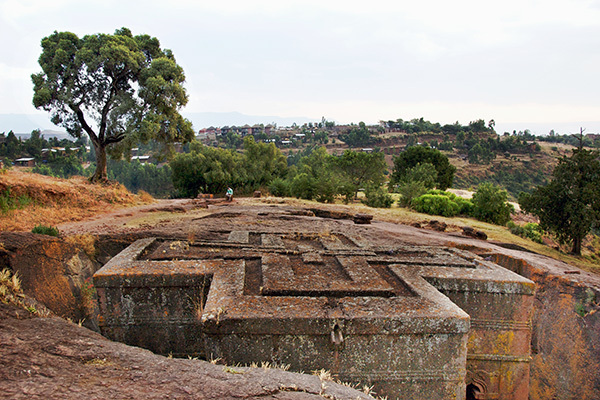 King Lalibela, the chosen one, proceeded to build the haunting rock-hewn churches, which stand today as testament to his unique vision. There is also an Ethiopian legend which says that bees once deafened the throne of god; and what is the throne of god if not the Ark of the Covenant, which Ethiopians claim is kept under armed guard in their country, in a temple in Axum. Further insight into the Isaiah texts comes from the fact that the historical authorship of the first thirty chapters is credited to the eighth-century prophet Isaiah, as opposed to the subsequent two sections, which are written by different authors. Some have speculated that Isaiah, in his youth, was influenced by the invasion of Israel by the Assyrian monarch Tiglath-Pileser III (2 Kings 15:19). It is also intriguing that Isaiah’s wife was called ‘the prophetess’ (Isaiah 8:3). While most historians believe this is due to her being the ‘wife of the prophet’ (Isaiah 38:1), others feel the title refers to her being endowed with the gift of prophecy, like Deborah (Judges 4:4) and Huldah (2 Kings 22:14–20). The possibility that Isaiah’s wife had the gift of prophecy is alluring, for ‘bee’ in Hebrew is DBRE, meaning Deborah, and Judges 5 contains one of the oldest passages in the Bible and, some believe, the earliest example of Hebrew poetry, the Song of Deborah, which translates as the Song of The Bee. Deborah, the prophetess, represented stability and was a warrior princess, and the only female judge of pre-monarchic Israel in the entire Old Testament. In short, she embodied the qualities of a queen bee. Furthermore, Deborah was said to sit under a palm tree, where the children of Israel came to her for judgment. 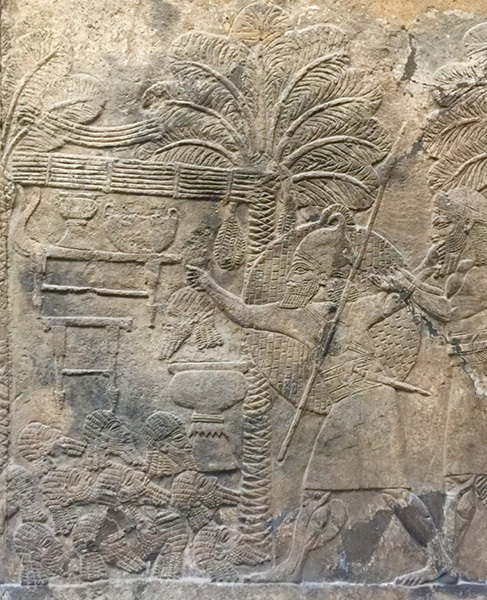 We will return to the importance of palm trees shortly, but suffice it to say that the reference to the bee in Assyria remains an intriguing connection between Assyrian kings and their bee-god protective spirits, as does the possibility that Isaiah’s wife was a prophetess, like Deborah. There is also an interesting Hittite myth involving bees (keep in mind that the Hittite empire (1600 BCE to 1178 BCE) was for a brief time coterminous with the Assyrian empire (1365 BCE to 612 BCE)) that chronicles the plight of Telepinu, the Hittite god of agriculture who lived in what is now Syria. The fable recounts how Telepinu, when upset or angry, caused the Hittite people to suffer, and animals (even plants) died as a result. One day Telepinu became so upset that he ventured into the countryside where he fell asleep for an extended period of time, prompting the earth to dry up and humans to become infertile, and worse; ‘Humans and gods perish from hunger,’ the story proclaims. The Sun-God responded by dispatching an eagle to find him, but to no avail. The Storm-God also failed. Then, as a last resort, a bee was sent to find the elusive Telepinu and, sure enough, the bee succeeded and proceeded to sting Telepinu until he awoke from his slumber, at which point he wiped Telepinu’s eyes and feet with beeswax. In short, the bee saved humankind. My honey-man, my honey-man sweetens me always . . . My lord, the honey-man of the gods . . . His hand is honey, his foot is honey . . . He took his pleasure of me . . . He laid me down on the fragrant honey-bed. The Akkadian greenstone seal (height 3.9cm) shown here, dating to about 2300 BC, is shown alongside its modern impression. Gods and goddesses are depicted, identified by their horned head-dresses and attributes as a hunting god, the goddess Ishtar, the sun god Shamash and the water god Enki followed by his vizier. 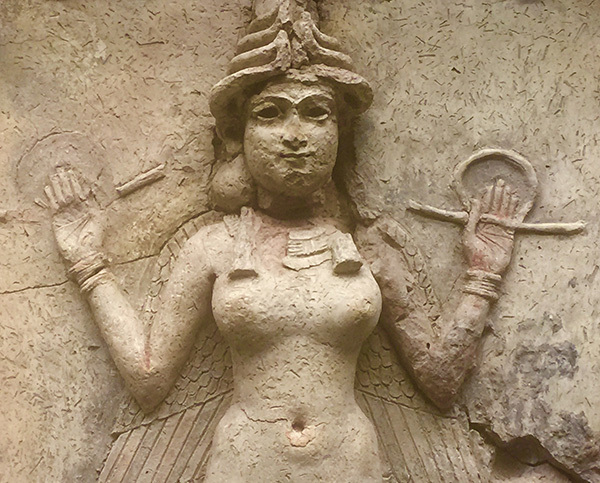 The description is benign and fails to mention that Ishtar, which is another name of Inanna, is depicted with what appears to be bee wings and, according to scholars, she is holding a date fruit from a palm tree. Furthermore, she is standing on a platform of beehives that spans the length of the seal. The Assyrian reliefs we inspected clearly portrayed a blessing scene and appeared to draw upon earlier traditions of Mesopotamian bee veneration. But what about the omnipresent date palms, I wondered. 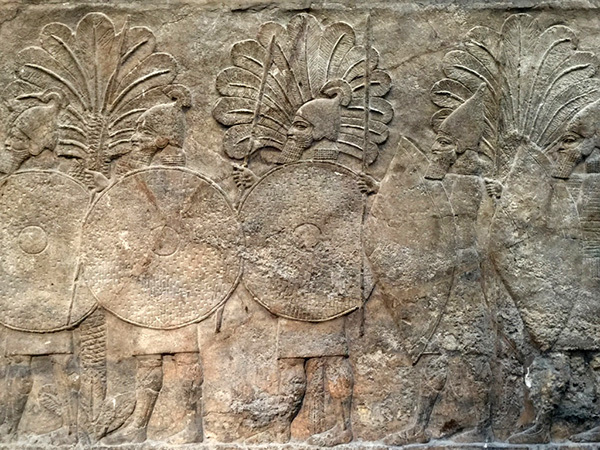 Why do they prominently appear in almost every Assyrian relief? Later that evening I did some digging and what I found astounded me. 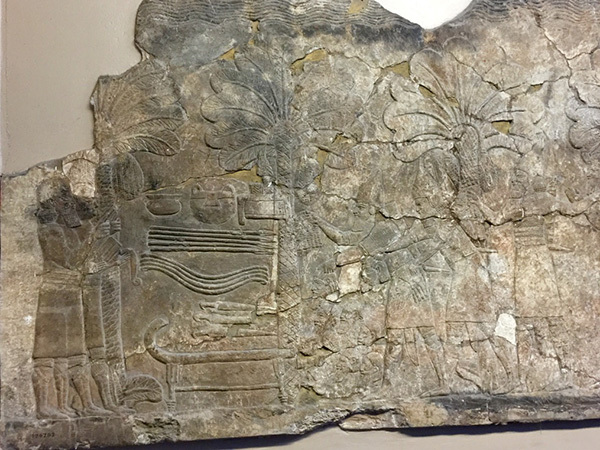 Assyrian war booty is kept under the sacred palm tree. In many similar reliefs a scribe holds a writing board covered in beeswax. The more I thought about it, the more I was not surprised that the date palm was sacred to ancient civilisations such as the Sumerians, Assyrians, Babylonians and Egyptians, for the distinctive-looking plant was featured in their art. I also learned that archaeological excavations revealed that these cultures constructed their houses (roofing in particular) with date-palm trunks. For instance, the Temple of the Moon-God Sin in Ur, Southern Iraq, only twelve kilometres from Eridu, used date-palm trunks in its construction, and date seeds over 5,000 years old were found in the city’s royal cemetery. 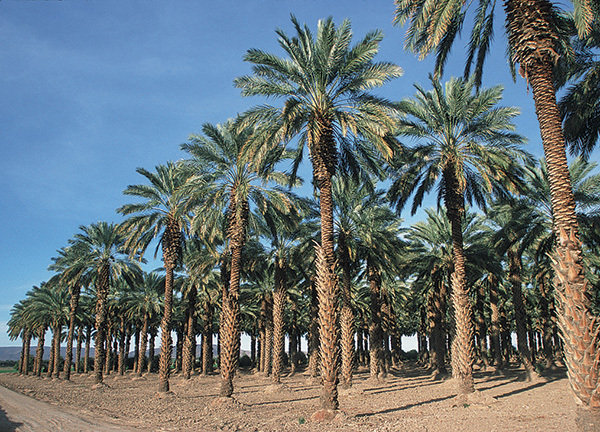 While experts are unsure where or when date palms first appeared, Sumerologist Benno Landsberger believes they preceded the Sumerian era (circa 4000 BCE), due to the Sumerian words for date (zulum) and date palm (gishimmar) belonging to a pre-Sumerian language. Interestingly, date-palm trunks have been used to keep bees since ancient times, and the technique is still practised in places such as Oman, a nation on the Arabian Peninsula. The abundant fruit tree has thrived for thousands of years, and why not? It can grow over twenty metres in height and live for over a hundred years, even in the driest and harshest of climates. I delved deeper and was surprised to discover that the date palm is revered by world religions, as well. In Islam, for instance, the Quran mentions the date palm over twenty times, while the Hadith of the Prophet Mohammed contains a staggering three hundred references and refers to the sacred tree as ‘God’s bounty’. 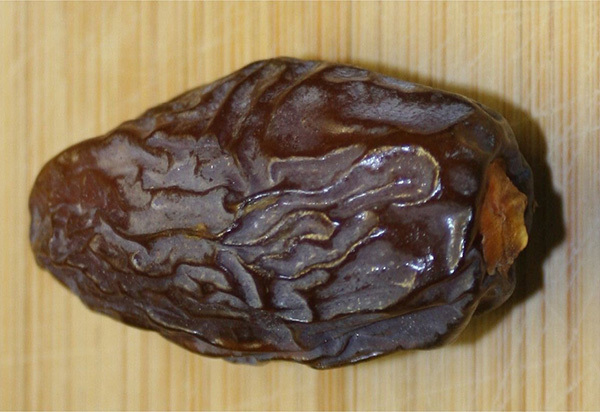 Also in Islamic tradition, the date palm was singled out as the ‘Tree of Life’ from the Garden of Eden. 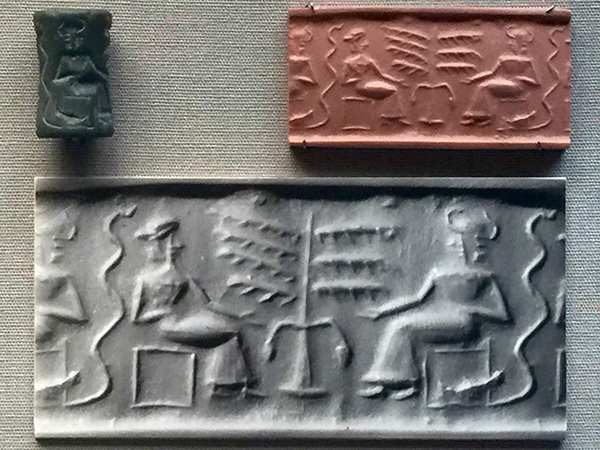 This theory is also borne out, and quite sensationally so, in the so-called Adam and Eve Seal, discovered in the Assyrian capital of Nineveh and dating to circa 2100 BCE, which shows what the British Museum calls a date palm and what appears to be Adam and Eve: a man, and woman with a snake behind her, each reaching for the date fruit. I was especially intrigued to learn that the date palm has male and female flowers (each on their own palm) and that manual pollination is required in order to maximise the yield. So the prominence of the date palm in Assyrian reliefs made sense; the cone-shaped object held by the Apkallu represented the male flower cluster of the date palm, and was dipped into the bag of pollen before the blessing ritual commenced. 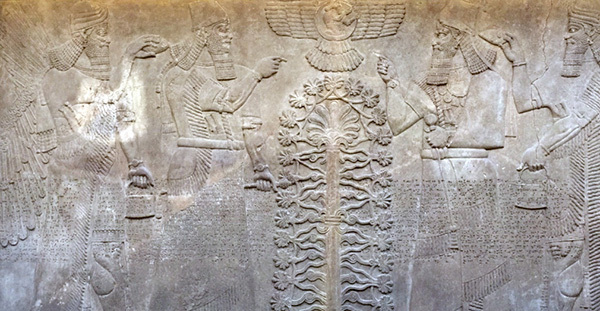 The imagery forms a potent symbol of regeneration, not only of the sacred tree, which appears to symbolise life itself, but also the King and his Assyrian Empire. It is an auspicious archetype, designed to manifest abundance on every level. 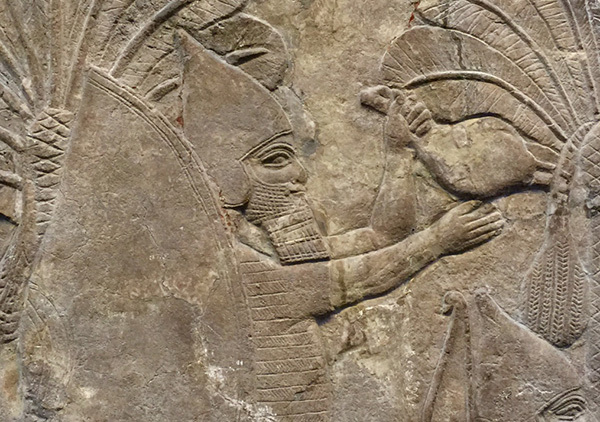 Interestingly, the Assyrian reliefs depicting protective gods and kings carrying pollen bags are not unique. 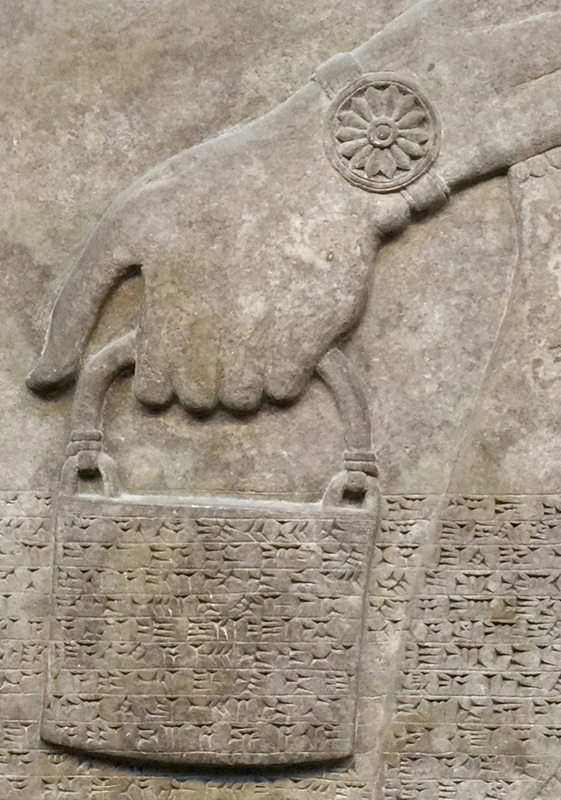 Rather, bag-carrying reliefs are found in countless indigenous cultures across the ancient world. This leads me to conclude that the bag-carrying tradition is a universal symbol, an archetype for ‘blessing, healing and/or magic’, depending on the context, while underscoring the bag carrier’s role as a bee-god. As we walked through the museum I recalled having seen reliefs of holy men carrying bags in Mesoamerica, from which I had just returned. I also remembered seeing bags depicted on reliefs in Göbekli Tepe in Turkey, a site I had visited last only a year ago, when I still lived in Istanbul. Göbekli Tepe is situated on the northern tip of Mesopotamia, just under six hundred miles north-west of Eridu and a short distance from the ancient city of Harran, complete with its peculiar beehive huts, structures that are believed to have been brought to the region from the south, in Babylonia. Göbekli Tepe was of special interest to me, for the site dates to the ninth millennium BCE and thus is the oldest evidence I have encountered of the blessing archetype. 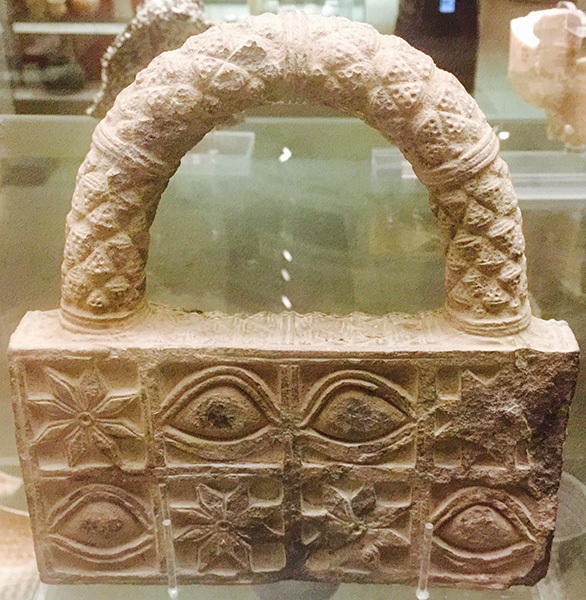 With these thoughts simmering in my head we entered the adjoining hall, where I immediately noticed an intriguing stone bag from Ur, circa 2500 BCE, not unlike the pollen bags the Assyrian reliefs portrayed, only this one was decorated with flowers. ‘Perfect,’ I thought. I could not help but think that the sacred pollen bag was represented, archaeologically, in many different shapes and forms. 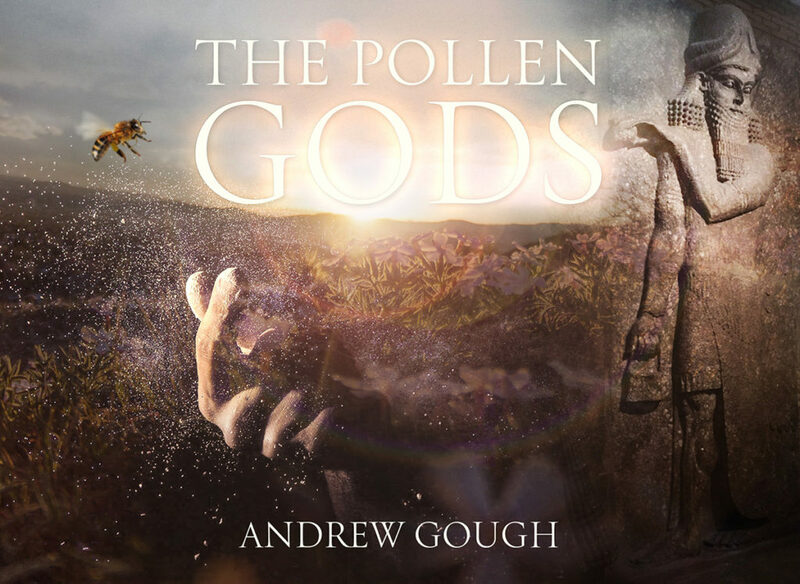 I feel it is important to not think of kings portrayed as bee-gods as being a speculative notion, for the honey bee and its many life-affirming by-products were vital to flourishing civilisations in antiquity. So, why should the King not revere them? Take for instance Ancient Egypt, where the King’s titles included ‘He of the Sedge and the Bee’ and ‘Beekeeper’, and where the King included a picture of the bee in his cartouche and was buried in a yellow and black, horizontally striped death mask that clearly appears to have been inspired by the bee. Further evidence of the importance of the bee in Ancient Egypt comes from the early dynastic Goddess Neith, who lived in the House of the Bee (Per-bit) in Sais, while her father Re wept bees as tears (Papyrus Salt 825). 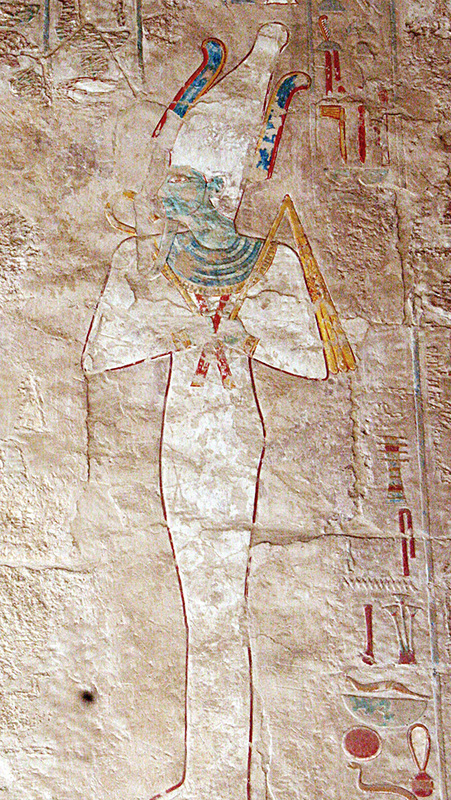 Also, King Aha, who is considered the second pharaoh of the First Dynasty (circa 3100 BCE), is believed to have travelled to Sais to pay homage to Neith (as suggested by the presence of Neith’s distinctive cult standard on a wooden label from Abydos, dating from his reign), thus reinforcing the importance of the cult of the bee in Egypt’s Pharaonic genesis. As an interesting aside, Sais is where the Rosetta Stone (which includes an image of the bee) originated before it was moved to the nearby village of Rosetta, where it was discovered. Sais is also where the Greek lawgiver Solon (638-558 BCE) visited and learned of the legend of Atlantis, as related to him by the priests of Sais, who were recounting the story from inscriptions on the pillars of Neith’s temple. (This account was probably quite similar to the lost civilisation portrayed in the Edfu texts). Solon’s account would later inspire Plato to write his opus on the famed lost civilisation, Timaeus, in circa 360 BCE and the rest, as they say, is history. 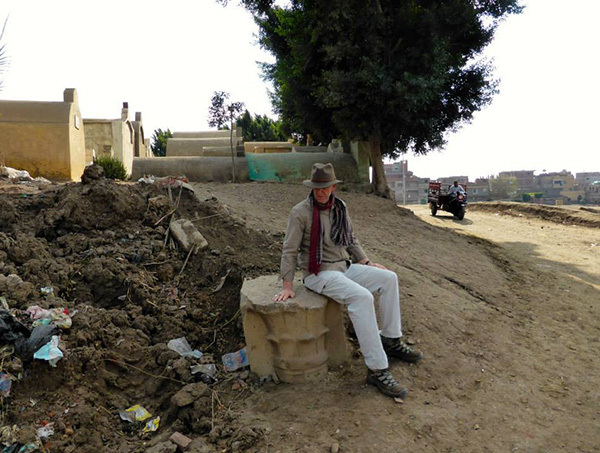 When I visited Sais in 2014 the villagers had only just uncovered the first evidence of a pillar of any kind. While Atlantis remains submerged, perhaps its legend, if nothing else, is rising after all. Even the God of the Dead, Osiris, is thought to be buried in Sais, in none other than the Mansion of the Bee. With respect to Osiris, I have discussed in past writings that the White Crown of Egypt, famously worn by Osiris, was a symbolic beehive (the sign of eternal wisdom) and its shape echoed that of the headdress worn by Enki, in Eridu, where the date palm was first cultivated and where the Apkallu originated. The distinctive conical shape is also found in Assyrian and Hittite royalty, and even on the headdress of statues of Popes in Vatican City, suggesting that the tradition continues – knowingly, or not. Was the White Crown of Egypt a symbolic beehive, a symbol of wisdom and leadership? While bee veneration in Egypt was thriving over 2,000 years prior to the creation of the Assyrian pollination/blessing reliefs, we know that pre-dynastic Egypt was heavily influenced by more advanced civilisations from the east, namely the Sumerians, which strongly suggests that bee veneration was part of a long-standing Mesopotamian tradition before it arrived in pre-dynastic Egypt. To this end we have discussed the Assyrian bee, the Hittite legend of Telepinu, where a bee saves humankind, and the mythology of Inanna, which, with its references to bees and Venus, appears to have inspired the Mayan legend where, once again, the bee saves humankind. However, there is yet another legend of bees and Mesopotamian history, and that is the journey of the Jaredites. The relatively modern Mormon faith is largely based on The Book of Mormon, a scripture from the Church of Jesus Christ of Latter-day Saints, of questionable age and authenticity. Nevertheless, The Book of Mormon features the Jaredites, a curious people, descendant from a man from Babel named Jared, their founder, who migrated to North America with bees, dragging their boats through ancient lands along the way. Curiously, the Jaredite expedition is said to have commenced at the time, and place, of the construction of the Tower of Babel. However, Eridu, and not Babylon, appears to have been the true location of the Tower of Babel (Rohl, David (2000), Legend: The Genesis of Civilisation), for each city had the root name Nunki, meaning ‘mighty place’ – hence the confusion in later translations. Unlike Babylon, Eridu has the archaeological evidence to support the existence of such a grand tower – a ziggurat of the appropriate stature and period in history. 1 And it came to pass that Jared and his brother, and their families, and also the friends of Jared and his brother and their families, went down into the valley which was northward (and the name of the valley was Nimrod, being called after the mighty hunter) with their flocks which they had gathered together, male and female, of every kind. In the best of conditions a new vineyard would take two or three seasons (years) to develop, but in wet and damaged soil the process would take much longer. Nevertheless, we are told that soon after the flood Noah was discovered naked, drunk and passed out in his tent, unable to reach even his bed. 21 He drank of the wine and became drunk, and uncovered himself inside his tent. 22 Ham, the father of Canaan, saw the nakedness of his father, and told his two brothers outside. Not only would honey have been part of any ancient wine, namely mead, but in many ancient lands honey was hallucinogenic and its strength could not reliably be estimated until consumed – especially if the bees’ pollinating process that produced the honey was affected by a multi-month journey in a boat with assorted other animals. I believe the best explanation for why Noah, a man of considerable fortitude (and who surely would have been able to handle his alcohol), was found so soon after the deluge, drunk and in a state of disarray, was that he had consumed a honey-based mead that was unexpectedly potent. with the golden bowl and the golden vats that the gods gave her. and his face like the face of one who has made a long journey. An astonishing work, far surpassing all other buildings of the same kind in both extent and height, and built with stones of rare size and excellence. The parable is also intriguing because Neith was known as the Veiled Goddess, long before Isis was associated with the title. Further, bees are often called hymenoptera, stemming from the word hymen, meaning ‘veil-winged’ and representing that which concealed the holy parts of a temple, as well as the veil or hymen of a woman’s reproductive organ. Siduri is the gatekeeper of the holy part of a temple, for she holds the knowledge of where Urshanabi, the ferryman, is located. He is the only one who can help Gilgamesh cross the subterranean ocean and the ominous ‘waters of death’ to reach Utnapishtim (the ‘Faraway’). A survivor of the deluge and precursor to Noah, he holds the secret of immortality. The fact that the whole story, especially Urshanabi the ferryman, sounds a lot like Greek mythology, and in particular recalls Charonthe ferryman of Hades who carries souls across the river Styx, is another story for another day. So, the first ever mention of wine is quite significant, indeed, for it involves bees and is a perfect fit both chronologically and geographically with the era in which the pollen bag and protective gods were king – both literally and figuratively. 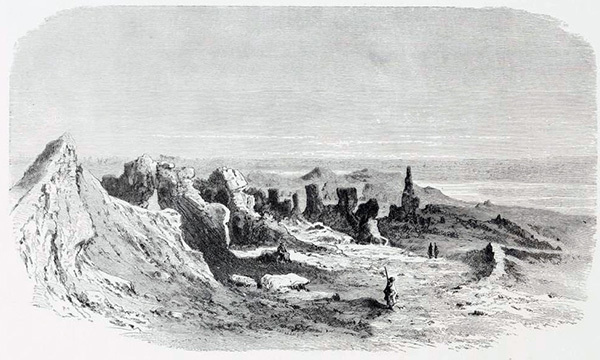 The Eastern Egyptian Desert is one of the regions through which the migrating Jaredites may have travelled after leaving the Tower of Babel, and its landscape is dotted with images of boats being dragged through the desert by men with bee-antenna plumes in their heads, and what I have identified as beehives in their boats. 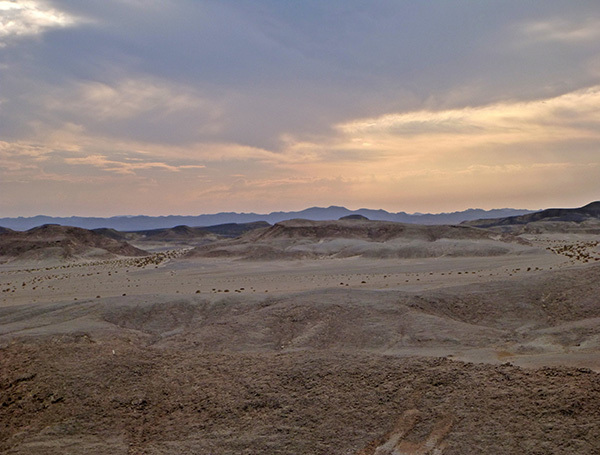 The Eastern Egyptian Desert is also the domain of the god Min, ‘Master of the Wild Bees’, with the high bee-antenna-like plumes. You can see where I am going with this. It is also interesting that the Red Crown of Egypt was called ‘dsrt’, and that E.A. Wallis Budge transcribed the Red Crown as ‘Deshret’, which is very similar to the Jaredite word for bee: ‘deseret’. Could both words refer to the honey bee? If so, then this would mean that both the Egyptian Crown (Wisdom of the King) and Red Crown (leadership over the worker bees) were inspired by bees. We have seen that Eridu was the first city on Earth and the home of the Apkulla and Enki, the Sumerian God with the beehive headdress that appears to be the precursor to the White Crown of Egypt and the headdress of the Popes of the Catholic Church. The Jaredite legend is consistent with Mesopotamian history and implies that bees were important enough to have been put on boats and transported across ancient lands to the western region of the United States, where Brigham Young – the first governor of the territory – named a four-state region ‘Deseret’, due to his belief that the honey bee was auspicious and represented industry and stability. The honey bee remains the dominant symbol of the region today. In fact, on Washington’s monument, in the nation’s capital, it says ‘Holiness to the Lord. Deseret’, meaning, ‘Holiness to the Lord, from the then western region of the United States known as The Honey Bee’. Our exploration of the bee in Mesopotamian history has been brief; some might say furious. Rest assured, there is more to be said on this matter. However, the focus of this discussion, with the exception of a few indulgent U-turns, was on the remarkable symbols of the pollen bag and pollinating date palm, a blessing archetype that has appeared not only on numerous Assyrian reliefs, but on stone carvings of many different kinds throughout the ancient world. Do these images confirm the importance of the bee in ancient cultures? Absolutely they do – of that we can be certain. You might even say it’s in the bag. 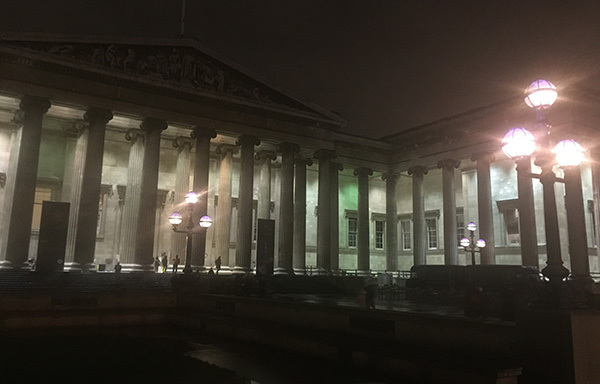 As my friend and I departed the British Museum we were astonished that it was already night-time. Darkness may have fallen, but the veil of light had been lifted.